I recently completed a total overhaul of my 2.0L LNF. I had it stripped down to the bare block and went through everything with a fine-tooth-comb. I was extremely cautious to keep things clean during assembly. However, I seem to have very tiny coolant drippage on the bottom of the bellhousing. Since the engine is back in the car, it's very hard to pinpoint the source. But I dug out pictures from when I removed the engine, to study the layout of the area. 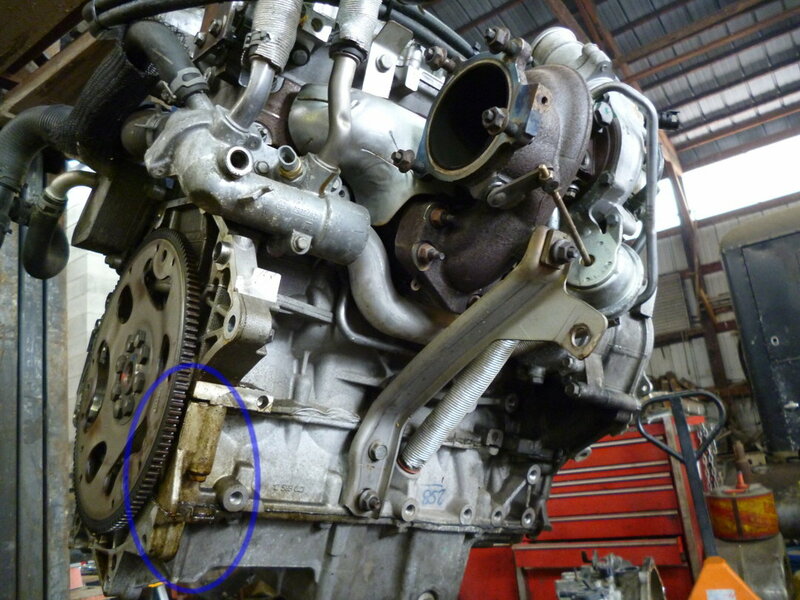 See the blue circled area in the attached pic when I had just taken the engine out of the chassis. 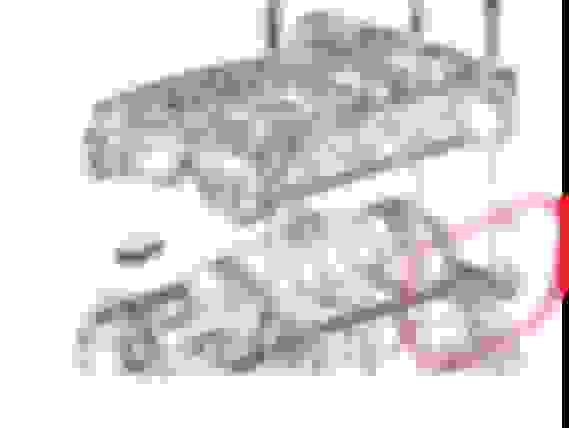 This is the area where my new leak is, and it appears from the picture that it may have been leaking in the same spot before I disassembled. For the life of me though, I can't see where the leak might come from. If it was the thermostat housing, I would expect the staining to start way up at the housing, but it only appears down low and only on the bedplate and oil pan. And I looked through hundreds of other pictures I took of the engine to see if anything in the lower block, bedplate, or oil pan might be the source of the leak; no dice though. I don't see anywhere it could come from, except possibly the thermostat housing, temp sensor, or turbo coolant line. Is this leak a known issue? Has anybody seen this before and pinpointed the source? There is no reason for coolant down there besides a drip. Are there water journals between the block halves? The arrow point to the front of the engine, and upside down. The black circles are the alignment dowels. donbrew no there are no coolant passages between the block and bedplate (i.e., lower block). I was wondering that too, but realized there are none after I reviewed all of my photos from building the engine. 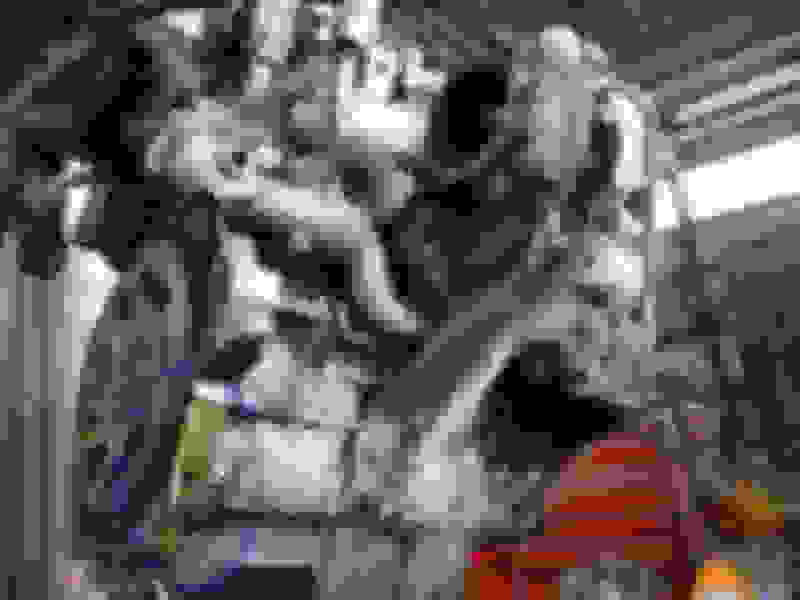 Additionally, I remember pressure-washing the bare block and when I stuck the water nozzle in the coolant jacket, nothing ever came out the very bottom of the block where the bedplate bolts on. I am thinking it has be a drip from above. The deposits/stains tend to be either where it sits longer or where it burns off. They can be misleading. Hmm, is the transmission stained or wet with coolant? There seems to be a leak from the heater hard line. The one on the right in your pic, with the indentation in it. Looks like a similar color stain. I had a leak in a similar location on my 2.2. It was the O-ring on the hard line going into the thermostat housing. From what I read before completing the repair, it is not unusual for that O-ring to get dis-formed and seep. IN my case it got a little worse as the weeks went on. I eventually replaced the O-ring at either end of that pipe, the thermostat, and the water pump while I was in there. The slight drip occurs right at the engine-to-trans interface. So with that in mind, you might think it could be trans fluid. However, I very carefully studied the drippage the other night and it is not the deep red color of trans fluid. It is closer to orange like DexCool. And since I scrubbed the block clean during the rebuild, it's pretty easy to see the color. And the consistency/viscosity is more like coolant than trans fluid. Yes, I mentioned the oil cooler in another thread last month. No, I didn't replace it. I pressure tested it and found no leaks. And it had no obvious signs of degradation (e.g., corrosion). So I opted to keep the original oil cooler. To that point, I studied the lines going into the cooler. 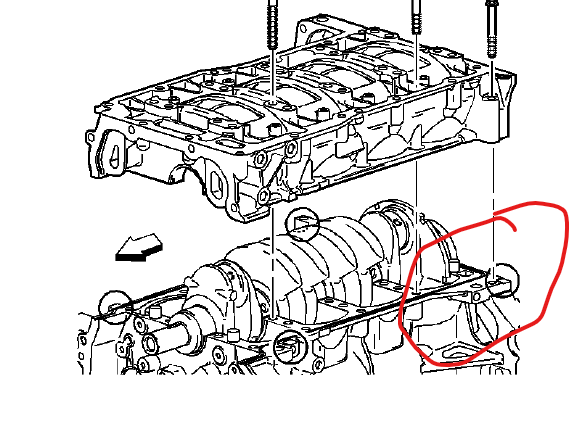 The geometry and layout of that area of the engine/trans, along with the slight slant of the engine don't permit leakage down in the area I'm seeing it. I know this for a fact because one of the rubber lines into the cooler was loose upon initial startup and dripped slightly. The drippage from that loose line drizzled down near the starter area. There was a tiny puddle from this leak atop the trans bellhousing, but again the layout of the area doesn't permit drippage down to the turbo side; but additionally, I cleaned that tiny puddle up. And I have pretty clear sight of those oil cooler lines with a mirror to see if they were still leaking, and I see none from them. I noticed that discoloration too, but that is not a leak. I don't know for sure, but I imagine a "glue" or sealant was smeared on the pipe before assembly to the thermo housing in manufacturing. And I guess some oozed out after assembly. Nevertheless, it is not the leak. Are you referring to the large diameter pipe (about 2") spanning between the water pump and thermo housing? If so, those o-rings are brand new; I replaced them during the rebuild. Yes, there is a remote possibility that they are leaking. But despite limited visibility, that is one spot I can see pretty clearly. I saw nothing coming from that pipe. I'll certainly check again. I have a dozen other pictures of this region of the engine and studied them again. The only thing that seems logical is the turbo coolant return line. It is directly above the location of the drippage. I plan to jack the car up this weekend to change the oil (it will then have a few hundred miles on it). Assuming the leak is still there (but hopefully not; fingers crossed), I plan to study the turbo coolant line very carefully to see if it's the source. Yeah, it's a pretty firm fit. I would think if something happened during reassembly it would be gushing.